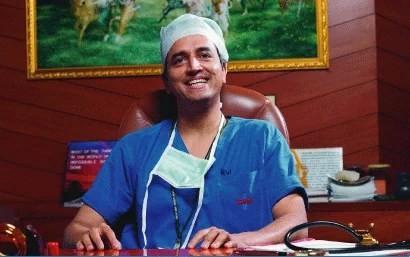 Dr. Devi Shetty was born at Kinnigoli village Dakshina Kannada district, Karnataka, India on May 8, 1953. After completing his graduate degree in Medicine and post-graduate work in General Surgery from Kasturba Medical College, Mangalore, he trained in cardiac surgery at Guy’s Hospital in the United Kingdom. In the year 1989, he returned to India and initially worked at B.M. Birla Hospital in Kolkata. After some time, he moved to Karnataka and started the Manipal Heart Foundation at Manipal Hospital in Bangalore. The list of his achievements is mind-boggling – the first heart surgeon in India to venture into neo-natal open-heart surgery, the first doctor in the world to perform open-heart surgery to close a hole in the heart with the help of a microchip camera, the first user of an artificial heart in India, the list is endless. And the latest feather in his cap has been the appointing of Narayana Hrudayalaya as the biggest telemedicine center in the world, catering to some 19 countries. 1953: Born in Mangalore, Karnataka, India. 1983-1989: Joined Cardiothoracic Unit of the Guy’s Hospital London. 1989: Started a 140-bed BM Birla Hospital in Kolkata. 1997: Shifted base to Bangalore. 2002: Won the Rajyotsava award. 2003: Won the Dr. B C Roy award, Sir M. Visvesvaraya Memorial Award and Ernst & Young – Entrepreneur Of The Year award. 2004: Won Padma Shri award for Medicine. 2005: Won Schwab Foundation`s award. 2013: Currently Chairman, Narayana Hrudayalaya Private Limited, Bangalore. Narayana Hrudayalaya, headquartered in the city of Bengaluru, India, is one of India’s largest multi-specialty hospital chains. The Bangalore cardiac unit of Narayana Hrudayalaya is one of the world’s largest pediatric heart hospitals. It is the brainchild of the renowned cardiac surgeon, Devi Shetty. Narayana Hrudayalaya also receives patients from outside India, and it has created a record of performing nearly 15,000 surgeries on patients from 25 foreign countries. It is also a renowned centre for telemedicine and it offers this service free of cost. Despite helping so many poor patients, it is known for being so efficient, that it has a higher profit margin (7.7% after tax) than most American Private Hospitals (6.9%). It has 5,000 beds (as of 2012) and it is building large hospitals across India totaling 30,000 beds, to enable it to gain large economies of scale and bargain down the cost of supplies to the hospitals. Narayana Hrudayalaya has innovated with the concept of health city which means “one point for all healthcare needs”. Its first health city was set up in the outskirts of Bengaluru. Financial contribution for the construction of the hospital was provided by Dr. Shetty’s father-in-law. Spread over 25 acres (100,000 m2), it is located in the Bommasandra Industrial Area on the Hosur Road in Bengaluru. With the Phase I of the construction being completed, the hospital currently has six stories containing 500 beds and 10 operating theatres. Narayana Hrudayalaya Health City, Bengaluru, is a conglomeration of hospitals in one campus. The Health City intends to cater to about 15,000 outpatients every day. Along with the world’s largest heart hospital with 1000 beds performing over 30 major heart surgeries a day, a full-fledged 1400-bed hospital that handles neurosurgery, neurology, paediatrics, nephrology, urology, gynaecology, gastroenterology and ear-nose-throat cases. Narayana Hrudayalaya in association with Mrs. Kiran Mazumdar Shaw of Biocon has launched the World’s largest cancer hospital with the latest infrastructure and equipments, internationally acclaimed faculty and affiliations with global centers of excellence in cancer care. The state-of-the-art Cancer Center is established to provide comprehensive and dedicated cancer care of the highest international standards with 20 operation theaters, three Elekta linear accelerators, brachytherapy, IMRT, IGRI & VMAT. Narayana Nethralaya is a superspecialty eye hospital with an infrastructure to perform 500 eye surgeries daily. SPARSH is an orthopaedic superspecialty hospital. The Narayana Hrudayalaya Health City in Bengaluru is an academic institution in the process of becoming a university. Dr Devi Shetty is originally from the erstwhile Kinnigoli, South Canara district in India (now divided into Dakshina Kannada and Udupi Districts of Karnataka). After completing his graduate degree in Medicine and post-graduate work in General Surgery from Kasturba Medical College, Mangalore, he trained in cardiac surgery at Guys Hospital in the United Kingdom. He returned to India in 1989 and initially worked at B.M. Birla Hospital in Kolkata. After some time, he moved to Bengaluru and started the Manipal Heart Foundation at Manipal Hospital, Bengaluru. Reading this really it make my mind fresh and eagerly make me to think for jobs as doctor in best specialization.I have my own page which can give us better and fast result for jobs.Try to view the site http://doctorschoiceplacement.com/candidates/ and share your views. Thank u so much paresh sir.I really get idea how to change my preparation planning in last 3 months for 2016pg.